Needs to be retracted prior to the mortgage application and approval process. 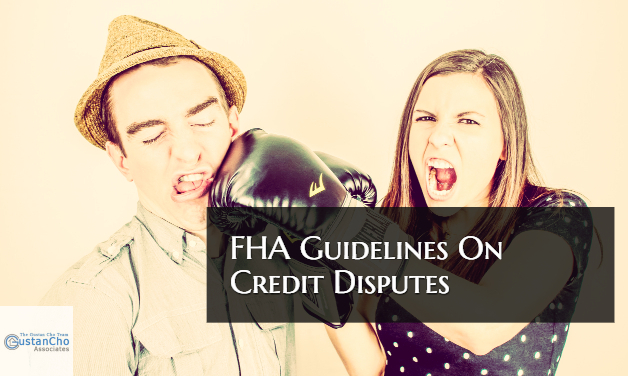 FHA Mortgage Guidelines On Credit Disputes exempts certain types of credit disputes. As mentioned earlier, FHA does not require for outstanding collection accounts to be paid off. This message is mainly to mortgage loan originators who issue pre-approval letters to home buyers. Loan Officers who issued pre-approval letters without thoroughly reviewing borrowers for pending credit disputes on credit report can create a lot of havoc to not just the home buyers but the home sellers and everyone involved in the mortgage process. There is a trick of the trade that credit disputes does not have to be retracted on late payments and derogatory credit tradelines. Many wonder why credit disputes are not allowed during the mortgage application process. Please not that once disputes are removed, credit scores will drop. Looking For Lender With No Overlays On FHA Loans? If mortgage loan officer made a mistake and issued a pre-approval letter with credit disputes and now no longer qualify because credit disputes retraction lowered credit scores, please contact us at Gustan Cho Associates at 262-716-8151 or text us for faster response. Or email us at gcho@loancabin.com. Gustan Cho Associates Mortgage Group at Loan Cabin Inc. are direct lenders licensed in multiple states with no lender overlays on FHA, VA, USDA, and Conventional Loans. All of our pre-approvals are fully underwritten and signed off by our underwriters. All of our pre-approvals close 100% because they are full credit approvals. Our licensed and support staff are available 7 days a week, evenings, weekends, and holidays to answer all of your questions.